The Vikings of recent vintage haven’t been able to put together a run. They have four playoff appearances since 2009, with none coming in back-to-back years. They have three first-place finishes and three in fourth. They have five winning records but the only consecutive ones were the last two years, when they followed up a dominant 13-3 2017 with a can-only-be-described-as-hugely-disappointing 8-7-1 2018. All told, the Vikings are 83-75-2 over the last 10 years. Yep, average. Let’s take a look at the best Vikings fantasy seasons of the last decade. Favre had more passing yards in 1995 and had more touchdowns in 1995, 1996, and 1997, but you could argue his 2009 was his most impressive season, especially considering he turned 40 in the middle of it. He set a career-high in passer rating (107.2 — surely in part a function of the changing league) and a career-low in interceptions (if you except a four-attempt rookie season in 1991) in leading the Vikings to a 12-4 finish and a crushing playoff loss. Kirk Cousins’ debut season in Minnesota came close to Favre’s 2009, but for now the old man reigns supreme. Peterson’s lack of receiving production kept him from the truly insane PPR seasons of some other backs (it blows my mind that he has only six career rushing scores). Over the first seven years of his career, he was the No. 1 fantasy back by almost 300 points over Maurice Jones-Drew, but in standard leagues his first-place lead is closer to 400. He has topped 1,000 rushing yards seven times (including, incredibly, 2018 at age 32) but was never better as a runner than his 2,000-yard 2012. He had five more touchdowns and 219 more receiving yards in 2009, but with 714 more yards on the ground in 2012, that takes the crown. Rudolph’s 120 targets in 2016 were his career-high by a lot — he had 86 in 2012 and 76 each in 2017 and 2018. As such, he also set career highs in receptions and yards. He didn’t set a career-high in touchdowns, because his scoring percentage in 2012 and 2017 was insane, but still, it was a genuinely dominant fantasy season for a tight end. 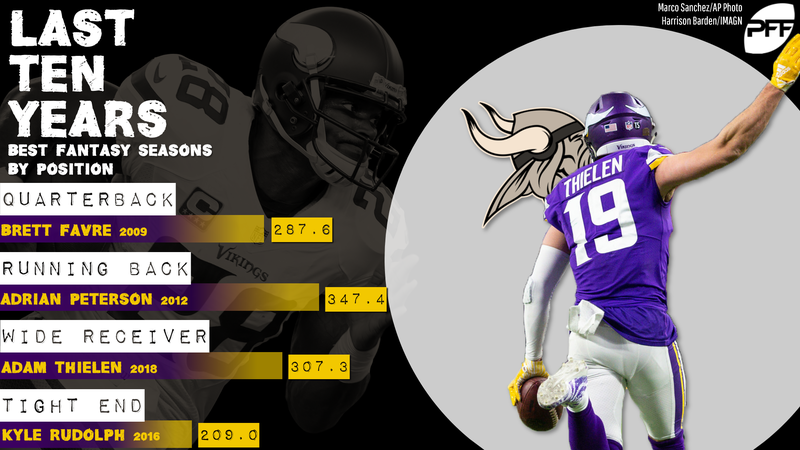 But that was the season before Diggs and Thielen really developed into the fantasy performers they are now, which explains why Rudolph’s target total dropped so much in the two years since. He’s a perfectly fine tight end. He’s not the guy he was in 2016.